Non-Millionaire investors consider many factors when selecting an investment; the level of risk at the forefront among them. The social responsibility of an investment is comparatively not a priority, according to a new Spectrem Group wealth level study of households with a net worth of at least $100,000, not including primary residence. Socially responsible investments encourage corporations to improve their practices on environmental, social and governance issues. 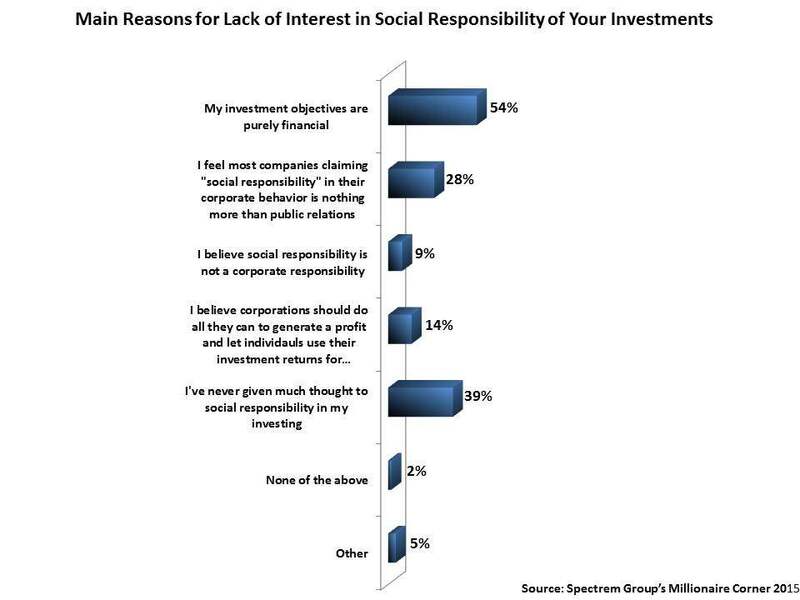 Just 36 percent of non-Millionaires consider social responsibility when selecting an investment, the Spectrem Group study finds. As with their wealthier counterparts, non-Millionaires indicate that their comparative lack of interest in socially responsible investments is because their investment objectives are purely financial (54 percent, compared with 57 percent of Millionaires who responded similarly). But non-Millionaires appear to be less cynical about corporate motives for socially responsible investments. Whereas 32 percent of Millionaires believe that corporate claims of social responsibility are nothing more than public relations, only 28 percent of non-Millionaires feel this way. Across age groups, Millennial-aged non-Millionaires were the most likely to express that their lack of interest in socially responsible investing is because their investment objectives are purely financial (60 percent), while Gen Xers ages 36-44 were more likely than surveyed non-Millionaires overall to say that social responsibility is merely a corporate public relations ploy (35 percent). When it comes down to it, about four-in-ten (39 percent) of non-Millionaires have not given much thought to social responsibility, the study finds.